James wrote, "You must all be quick to listen, slow to speak, and slow to get angry." How would your communication with others change (improve) if you allowed this piece of wisdom to drive your conversations? I've heard it said that God designed us to communicate well by giving us two ears and one mouth. Therefore we should listen twice as much as we speak. While this may not be a theologically accurate statement, the idea of listening more than speaking carries much value. Communication is about more than just speaking and listening though. Effective communication is about UNDERSTANDING. Listening alone is very rarely enough to gain understanding and speaking alone is rarely enough to create understanding. A third piece is not just helpful, it's necessary. Effective communication also requires asking. LISTEN: Understanding begins with listening. It's not enough to simply "hear" what someone else is saying, I need to fully give myself to listening, not just with my ears but with my eyes and my heart and my head. Often I need to dig beneath the initial words I hear to get to the heart of what someone else is trying to say. Watching their expressions and gestures. Recognizing key words or repeated words. These are all critical elements of true listening and they are all tools I can use to gain understanding. ASK: Too often, communication fails when one person listens once and assumes they've gained complete understanding. Even though you may have heard every word, and observed every piece of non-verbal communication; you still may not be interpreting another person's ideas accurately. Once you've listened, BEFORE YOU RESPOND, ask a question. Your question may be a simple restatement of what you think you've heard. Your question might seek clarification about something you've heard. You might point back to a key word or expression and ask for more input about that. Whatever question you ask, your goal should be to gain understanding. Before you ever respond to someone else, make sure you know exactly to what you are responding. I think this is probably what James was talking about when he warned people to be SLOW TO ANGER. Poor communication often leads to anger because someone reacts before they understand. They may have misread a statement or they may be unfairly imputing a feeling or emotion onto someone else. In any of these cases a few simple questions may avoid misunderstanding and will likely steer the conversation clear of anger and hurt feelings. OFFER: Your words are a gift. Wrap them appropriately. Spouting off the first thing that comes into your mind is almost never a good idea and almost always leads to regret and more problems. Reuben Feffer's father only speaks one line in the entire movie, Along Came Polly. But his one line provides the life-changing advice desperately needed by Reuben's friend Sandy Lyle. Few words are almost always more helpful than many. Proverbs 10:19 says, "Too much talk leads to sin. Be sensible and keep your mouth shut." Good communication takes effort and time. It doesn't happen overnight. Usually, it takes (at least) two to tango. 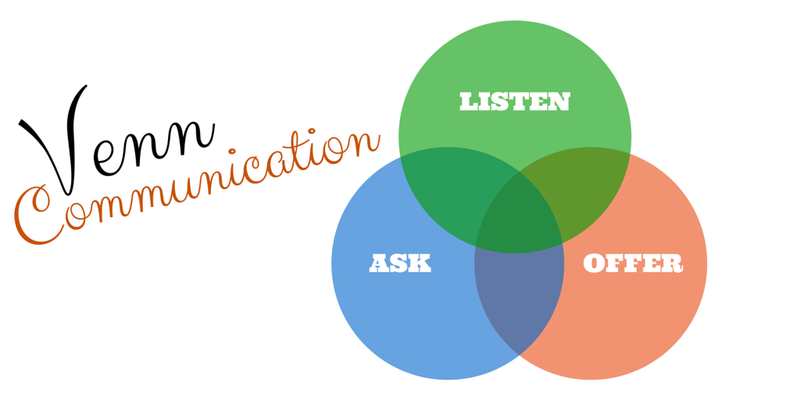 But even if those around you aren't committed to effective communication, you can still begin taking the steps to be a VENN COMMUNICATOR. Offer your words when necessary. How Should Christians Process Horrific Tragedies?